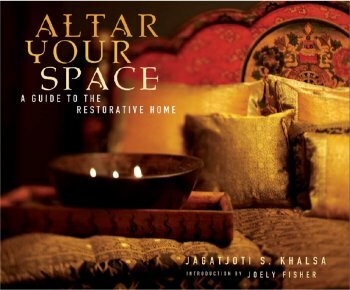 Tara Home designer and founder, Jagatjoti Khalsa’s, new book Altar Your Space: A Guide To The Restorative Home will help you transform your home into a sacred space that nourishes your soul. Acknowledge what you are about to do. Stand at the opening or doorways of each room and take a deep breath. Through the minds eye, try and see the ways that you most often have used this space with your partner/spouse. You are trying to see what experiences and feelings have been anchored in this room emotionally from your past relationship. You might find that you are used to coming home and seeing your partner in that chair, or with feet up watching TV or sipping an evening drink. You are looking for the anchors to change. If the anchors are mostly in furniture placement and uses of the space, then this is generally an easy first change to under take. Try to find new ways to lay out the room and change some of the placements to freshen it up. Look for objects in the room that are solely centered and identified with your partner such as a favorite blanket, shawl, or chair. Unless you can convert these into objects that will serve you and represent something else, get rid of them so they don’t continue to sadden you about the end of your relationship. Bring items and actions in the space that creates optimism and hopefulness. 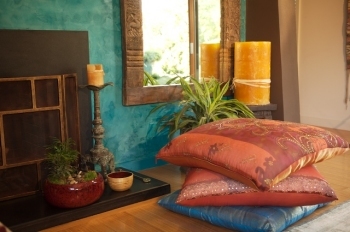 Add objects that bring you comfort such as a cozy shawl, throw, cashmere blanket, oversized pillows, or a new vase. Add an altar to any room. It’s a place to start fresh, let go, and project hope. Place objects that represent those pieces of you that you love and that represents love to you. Play music to clear, clean and change the feeling in the space. Discover new music that feels warm, healing, uplifting, and inspiring. Get into the habit of putting music on when you leave for the day and when you open the doors to your home, you will feel received and welcomed. Visit tara-home.com to view Khalsa’s collections and look for his new book due out in mid-October at your local Barnes & Noble store.